A while ago, in Part Three – Hays, Imbrie & Shackleton we looked at a seminal paper from 1976. In that paper, the data now stretched back far enough in time for the authors to demonstrate something of great importance. They showed that changes in ice volume recorded by isotopes in deep ocean cores (see Seventeen – Proxies under Water I) had significant signals at the frequencies of obliquity, precession and one of the frequencies of eccentricity. Obliquity is the changes in the tilt of the earth’s axis, on a period around 40 kyrs. Precession is the change in the closest approach to the sun through the year (right now the closest approach is in NH winter), on a period around 20 kyrs (see Four – Understanding Orbits, Seasons and Stuff). Both of these involve significant redistributions of solar energy. Obliquity changes the amount of solar insolation received by the poles versus the tropics. Precession changes the amount of solar insolation at high latitudes in summer versus winter. (Neither changes total solar insolation). This was nicely in line with Milankovitch’s theory – for a recap see Part Three. The waxing and waning of the ice sheets has 40 kyr and 20 kyr periods which is caused by the changing distribution of solar insolation due to obliquity and precession. The largest signal in ocean cores over the last 800 kyrs has a component of about 100 kyrs (with some variability). That is, the ice ages start and end with a period of about 100 kyrs. Eccentricity varies on time periods of 100 kyrs and 400 kyrs, but with a very small change in total insolation (see Part Four). The start and end of the ice ages has 100 kyr periods which is caused by the changing eccentricity of the earth’s orbit. Theory A and Theory B are both in the same paper and are both theories that “link ice ages to orbital changes”. In their paper they demonstrated Theory A but did not prove or demonstrate Theory B. Unfortunately, Theory B is the much more important one. The dominant 100,000 year climatic component has an average period close to, and is in phase with, orbital eccentricity. Unlike the correlations between climate and the higher frequency orbital variations (which can be explained on the assumption that the climate system responds linearly to orbital forcing) an explanation of the correlations between climate and eccentricity probably requires an assumption of non-linearity. The only quibble I have with the above paragraph is the word “probably”. This word should have been removed. There is no doubt. An assumption of non-linearity is required as a minimum. Now why does it “probably” or “definitely” require an assumption of non-linearity? And what does that mean? A linearity assumption is one where the output is proportional to the input. For example: double the weight of a vehicle and the acceleration halves. Most things in the real world, and most things in climate are non-linear. So for example, double the temperature (absolute temperature) and the emitted radiation goes up by a factor of 16. However, there isn’t a principle, an energy balance equation or even a climate model that can take this tiny change in incoming solar insolation over a 100 kyr period and cause the end of an ice age. In fact, their statement wasn’t so much “an assumption of non-linearity” but “some non-linearity relationship that we are not currently able to model or demonstrate, some non-linearity relationship we have yet to discover”. The dominant 100,000 year climatic component has an average period close to, and is in phase with, orbital eccentricity. Unlike the correlations between climate and the higher frequency orbital variations.. an explanation of the correlations between climate and eccentricity is as yet unknown, remains to be demonstrated and there may in fact be no relationship at all. Unfortunately, because Theory A and Theory B were in the same paper and because Theory A is well demonstrated and because there is no accepted alternative on the cause of the start and end of ice ages (there are alternative hypotheses around natural resonance) Theory B has become “well accepted”. And because everyone familiar with climate science knows that Theory A is almost certainly true, when you point out that Theory B doesn’t have any evidence, many people are confused and wonder why you are rejecting well-proven theories. In the series so far, except in occasional comments, I haven’t properly explained the separation between the two theories and this article is an attempt to clear that up. Now I will produce a sufficient quantity of papers and quote their “summary of the situation so far” to demonstrate that there isn’t any support for Theory B. The only support is the fact that one component frequency of eccentricity is “similar” to the frequency of the ice age terminations/inceptions, plus the safety in numbers support of everyone else believing it. One other comment on paleoclimate papers attempts to explain the 100 kyr period. It is the norm for published papers to introduce a new hypothesis. That doesn’t make the new hypothesis correct. So if I produce a paper, and quote the author’s summary of “the state of work up to now” and that paper then introduces their new hypothesis which claims to perhaps solve the mystery, I haven’t quoted the author’s summary out of context. Let’s take it as read that lots of climate scientists think they have come up with something new. What we are interesting in is their review of the current state of the field and their evidence cited in support of Theory B. Before producing the papers I also want to explain why I think the idea behind Theory B is so obviously flawed, and not just because 38 years after Hays, Imbrie & Shackleton the mechanism is still a mystery. If a non-linear relationship can be established between a 0.1% change in insolation over a long period, it must also explain why significant temperature fluctuations in high latitude regions during glacials do not cause a termination. The “non-linearity” hypothesis has more than one hill to climb. This second challenge is even more difficult than the first. A tiny change in total insolation causes, via a yet to be determined non-linear effect, the end of each ice age, but this same effect does not amplify frequent large temperature changes of long duration to end an ice age (note 1). Many papers which propose orbital reasons for ice age terminations do not propose eccentricity variations as the cause. Instead, they attribute terminations to specific insolation changes at specific latitudes, or various combinations of orbital factors completely unrelated to eccentricity variations. See Part Six – “Hypotheses Abound”. Of course, one of these might be right. For now I will call them the family, so we remember that Theory C is not one theory, but a whole range of mostly incompatible theories. But remember where the orbital hypothesis for ice age termination came from – the 100,000 year period of eccentricity variation “matching” (kind of matching) the 100,000 year period of the ice ages. The Theory C Family does not have that starting point. So let’s move onto papers. I started by picking off papers from the right category in my mind map that might have something to say, then I opened up every one of about 300 papers in my ice ages folder (alphabetical by author) and checked to see whether they had something to say on the cause of ice ages in the abstract or introduction. Most papers don’t have a comment because they are about details like d18O proxies, or the CO2 concentration in the Vostok ice core, etc. That’s why there aren’t 300 citations here. And bold text within a citation is added by me for emphasis. I looked for their citations (evidence) to back up any claim that orbital variations caused ice age terminations. In some cases I pull up what the citations said. At the end of the last interglacial period, over 100,000 yr ago, the Earth’s environments, similar to those of today, switched into a profoundly colder glacial mode. Glaciers grew, sea level dropped, and deserts expanded. The same transition occurred many times earlier, linked to periodic shifts of the Earth’s orbit around the Sun. The mechanism of this change, the most important puzzle of climatology, remains unsolved. Note that “linked to periodic shifts of the Earth’s orbit” is followed by an “unknown mechanism”. Two of the authors were the coauthors of the classic 1976 paper that is most commonly cited as evidence for Theory B. The most significant climate variability in the Quaternary record is the alternation between glacial and interglacial, occurring at approximately 100 ka periodicity in the most recent 800 ka. This signal is of global scale, and observed in all climate records, including the long Antarctic ice cores (Jouzel et al., 2007a) and marine sediments (Lisiecki and Raymo, 2005). There is a strong consensus that the underlying cause of these changes is orbital (i.e. due to external forcing from changes in the seasonal and latitudinal pattern of insolation), but amplified by a whole range of internal factors (such as changes in greenhouse gas concentration and in ice extent). Note the lack of citation for the underlying causes being orbital. However, as we will see, there is “strong consensus”. In this specific paper from the words used I believe the authors are supporting the Theory C Family, not Theory B. It is generally accepted that the timing of glacials is linked to variations in solar insolation that result from the Earth’s orbit around the sun (Hays et al. 1976; Huybers and Wunsch 2005). These solar radiative anomalies must have been amplified by feedback processes within the climate system, including changes in atmospheric greenhouse gas (GHG) concentrations (Archer et al. 2000) and ice-sheet growth (Clark et al. 1999), and whilst hypotheses abound as to the details of these feedbacks, none is without its detractors and we cannot yet claim to know how the Earth system produced the climate we see recorded in numerous proxy records. I think I will classify this one as “Still a mystery”. Note that support for “linkage to variations in solar insolation” consists of Hays et al 1976 – Theory B – and Huybers and Wunsch 2005 who propose a contradictory theory (obliquity) – Theory C Family. In this case they absolve themselves by pointing out that all the theories have flaws. For the past 20 years, the Milankovitch hypothesis, which holds that the Earth’s climate is controlled by variations in incoming solar radiation tied to subtle yet predictable changes in the Earth’s orbit around the Sun [Hays et al., 1976], has been widely accepted by the scientific community. However, the degree to which and the mechanisms by which insolation variations control regional and global climate are poorly understood. In particular, the “100-kyr” climate cycle, the dominant feature of nearly all climate records of the last 900,000 years, has always posed a problem to the Milankovitch hypothesis..
..time interval between terminations is not constant; it varies from 84 kyr between Terminations IV and V to 120 kyr between Terminations III and II. In conclusion, it is proposed that the interaction between obliquity and the eccentricity-modulation of precession as it controls northern hemisphere summer radiation is responsible for the pattern of ice volume growth and decay observed in the late Quaternary. Solution was unknown, but new proposed solution is from the Theory C Family. Glaciation (deglaciation) is one of the most extreme and fundamental climatic events in Earth’s history.. As a result, fluctuations in orbital forcing (e.g. Berger 1978; Berger and Loutre 1991) have been widely recognised as the primary triggers responsible for the glacial-interglacial cycles (Berger 1988; Bradley 1999; Broecker and Denton 1990; Crowley and North 1991; Imbrie and Imbrie 1979). At the same time, these studies revealed the complexity of the climate system, and produced several paradoxes which cannot be explained by a simple linear response of the climate system to orbital forcing. At this point I was interested to find out how well these 4 papers cited (Berger 1988; Bradley 1999; Broecker and Denton 1990; Crowley and North 1991; Imbrie and Imbrie 1979) backed up the evidence for orbital forcing being the primary triggers for glacial cycles. Such a linkage cannot explain synchronous climate changes of similar severity in both polar hemispheres. Also, it cannot account for the rapidity of the transition from full glacial toward full interglacial conditions. If glacial climates are driven by changes in seasonality, then another linkage must exist. We propose that Quaternary glacial cycles were dominated by abrupt reorganizations of the ocean- atmosphere system driven by orbitally induced changes in fresh water transports which impact salt structure in the sea. These reorganizations mark switches between stable modes of operation of the ocean-atmosphere system. Although we think that glacial cycles were driven by orbital change, we see no basis for rejecting the possibility that the mode changes are part of a self- sustained internal oscillation that would operate even in the absence of changes in the Earth’s orbital parameters. If so, as pointed out by Saltzman et al. (1984), orbital cycles can merely modulate and pace a self-oscillating climate system. So this paper is evidence for Theory B or Theory C Family? “..we think that..” “..we see no basis for rejecting the possibility ..self-sustained internal oscillation”. This is evidence for the astronomical theory? I can’t access Milankovitch theory and climate, Berger 1988 (thanks, Reviews of Geophysics!). If someone has it, please email it to me at scienceofdoom – you know what goes here – gmail.com. The other two references are books, so I can’t access them. Crowley & North 1991 is Paleoclimatology. Vol 16 of Oxford Monograph on Geology and Geophysics, OUP. Imbrie & Imbrie 1979 is Ice Ages: solving the mystery. However, the reason for the spacing and timing of interglacials, and the sequence of events at major warmings, remains obscure. Between about 19,000 and 10,000 years ago, Earth emerged from the last glacial period. The whole globe warmed, ice sheets retreated from Northern Hemisphere continents and atmospheric composition changed significantly. Many theories try to explain what triggered and sustained this transformation (known as the glacial termination), but crucial evidence to validate them is lacking. A major puzzle of paleoclimatology is why, after a long interval of cooling climate, each late Quaternary ice age ended with a relatively short warming leg called a termination. We here offer a comprehensive hypothesis of how Earth emerged from the last global ice age..
Understanding the causes of the Pleistocene ice ages has been a significant question in climate dynamics since they were discovered in the mid-nineteenth century. The identification of orbital frequencies in the marine 18O/16O record, a proxy for global ice volume, in the 1970s demonstrated that glacial cycles are ultimately paced by astronomical forcing. The citation is Hays, Imbrie & Shackleton 1976. Theory B with no support. According to the Milankovitch theory, changes in summer insolation in the high-latitude Northern Hemisphere caused glacial cycles through their impact on ice-sheet mass balance. Statistical analyses of long climate records supported this theory, but they also posed a substantial challenge by showing that changes in Southern Hemisphere climate were in phase with or led those in the north. The citation is Hays, Imbrie & Shackleton 1976. (Many of the same authors in this and the paper above). The climate of the last 500,000 years (500 kyr) was characterized by extremely strong 100-kyr cyclicity, as seen particularly in ice-core and marine-sediment records. During the earlier part of the Quaternary (before 1 million years ago; 1 Myr BP), cycles of 41 kyr dominated. The period in between shows intermediate behaviour, with marine records showing both frequencies and a lower amplitude of the climate signal. However, the reasons for the dominance of the 100-kyr (eccentricity) over the 41-kyr (obliquity) band in the later part of the record, and the amplifiers that allow small changes in radiation to cause large changes in global climate, are not well understood. Is this accepting Theory B or not? Now onto the alphabetical order..
To explain why the ice sheets in the Northern Hemisphere grew to the size and extent that has been observed, and why they retreated quickly at the termination of each 100 kyr cycle is still a challenge (Tarasov and Peltier, 1997a; Berger et al., 1998; Paillard, 1998; Paillard and Parrenin, 2004). Although it is now broadly accepted that the orbital variations of the Earth influence climate changes (Milankovitch, 1930; Hays et al., 1976; Berger, 1978), the large amplitude of the ice volume changes and the geographical extent need to be reproduced by comprehensive models which include nonlinear mechanisms of ice sheet dynamics (Raymo, 1997; Tarasov and Peltier, 1997b; Paillard, 2001; Raymo et al., 2006). It is not the aim of this paper to draw definitive conclusions about the astronomical theory of paleoclimates but simply to provide geologists with accurate theoretical values of the earth’s orbital elements and insolation..
And this is simply again noting that the period for eccentricity is “similar” to the period for the ice age terminations. Theory B with no support. Milankovitch theory proposes that summer insolation at high northern latitudes drives the glacial cycles, and statistical tests have demonstrated that the glacial cycles are indeed linked to eccentricity, obliquity and precession cycles. Yet insolation alone cannot explain the strong 100,000-year cycle, suggesting that internal climatic feedbacks may also be at work. Earlier conceptual models, for example, showed that glacial terminations are associated with the build-up of Northern Hemisphere ‘excess ice’, but the physical mechanisms underpinning the 100,000-year cycle remain unclear. The citations for the statistical tests are Lisiecki 2010 and Huybers 2011. Huybers 2011 claims that obliquity and precession (not eccentricity) are linked to deglaciations. This is development of his earlier, very interesting 2007 hypothesis (Glacial variability over the last two million years: an extended depth-derived agemodel, continuous obliquity pacing, and the Pleistocene progression – to which we will return) that obliquity is the prime factor (not necessarily the cause) in deglaciations. The cause of these massive shifts in climate remains unclear not for lack of models, of which there are now over thirty, but for want of means to choose among them. Previous statistical tests have demonstrated that obliquity paces the 100-kyr glacial cycles [citations are his 2005 paper with Carl Wunsch and his 2007 paper], helping narrow the list of viable mechanisms, but have been inconclusive with respect to precession (that is, P > 0.05) because of small sample sizes and uncertain timing..
Variations in the eccentricity (100,000 yr), obliquity (41,000 yr) and precession (23,000 yr) of Earth’s orbit have been linked to glacial–interglacial climate cycles. It is generally thought that the 100,000-yr glacial cycles of the past 800,000 yr are a result of orbital eccentricity [1–4] . However, the eccentricity cycle produces negligible 100-kyr power in seasonal or mean annual insolation, although it does modulate the amplitude of the precession cycle. Alternatively, it has been suggested that the recent glacial cycles are driven purely by the obliquity cycle [5–7]. Here I use statistical analyses of insolation and the climate of the past five million years to characterize the link between eccentricity and the 100,000-yr glacial cycles. Using cross-wavelet phase analysis, I show that the relative phase of eccentricity and glacial cycles has been stable since 1.2 Myr ago, supporting the hypothesis that 100,000-yr glacial cycles are paced [8–10] by eccentricity [4,11]. However, I find that the time-dependent 100,000-yr power of eccentricity has been anticorrelated with that of climate since 5 Myr ago, with strong eccentricity forcing associated with weaker power in the 100,000-yr glacial cycle. I propose that the anticorrelation arises from the strong precession forcing associated with strong eccentricity forcing, which disrupts the internal climate feedbacks that drive the 100,000-yr glacial cycle. This supports the hypothesis that internally driven climate feedbacks are the source of the 100,000-yr climate variations. So she accepts that Theory B is generally accepted, although some Theory C Family advocates are out there, but provides a new hybrid solution of her own. 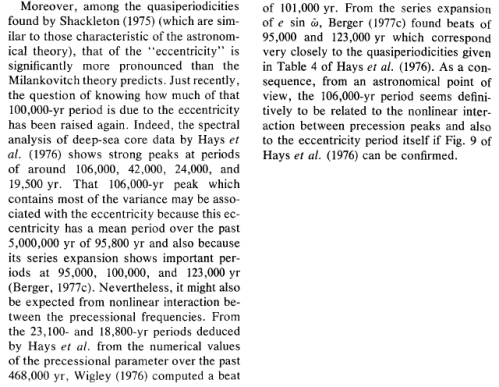 References for the orbital eccentricity hypothesis [1-4] include Hays et al 1976 and Raymo 1997 cited above. However, Raymo didn’t think it had been demonstrated prior to her 1997 paper and in her 1997 paper introduces the hypothesis that is primarily ice sheet size, obliquity and precession modulated by eccentricity. References for the obliquity hypothesis [5-7] include the Huybers & Wunsch 2005 and Huybers 2007 covered just before this reference. So in summary – going back to how we dragged up these references – Abe-Ouchi and co-authors provide two citations in support of the statistical link between orbital variations and deglaciation. One citation claims primarily obliquity with maybe a place for precession – no link to eccentricity. Another citation claims a new theory for eccentricity as a phase-locking mechanism to an internal climate process. These are two mutually exclusive ideas. But at least both papers attempted to prove their (exclusive) ideas. Since the paper by Hays et al. (1976), spectral analyses of climate proxy records provide substantial evidence that a fraction of the climatic variance is driven by insolation changes in the frequency ranges of obliquity and precession variations. However, it is the variance components centered near 100 kyr which dominate most Upper Pleistocene climatic records, although the amount of insolation perturbation at the eccentricity driven periods close to 100-kyr (mainly the 95 kyr- and 123 kyr-periods) is much too small to cause directly a climate change of ice-age amplitude. Many attempts to find an explanation to this 100-kyr cycle in climatic records have been made over the last decades. In spite of considerable progress in studies of past climate changes, the nature of vigorous climate variations observed during the past several million years remains elusive. A variety of different astronomical theories, among which the Milankovitch theory [Milankovitch, 1941] is the best known, suggest changes in Earth’s orbital parameters as a driver or, at least, a pacemaker of glacial-interglacial climate transitions. However, the mechanisms which translate seasonal and strongly latitude-dependent variations in the insolation into the global-scale climate shifts between glacial and interglacial climate states are the subject of debate. The ice-age cycles have been linked to changes in Earth’s orbital geometry (the Milankovitch or Astronomical theory) through spectral analysis of marine oxygen-isotope records (3), which demonstrate power in the ice-age record at the same three spectral periods as orbitally driven changes in insolation. However, explaining the 100 thousand- year (ky)–recurrence period of ice ages has proved to be problematic because although the 100-ky cycle dominates the ice-volume power spectrum, it is small in the insolation spectrum. In order to understand what factors control ice age cycles, we must know the extent to which terminations are systematically linked to insolation and how any such linkage can produce a non- linear response by the climate system at the end of ice ages. 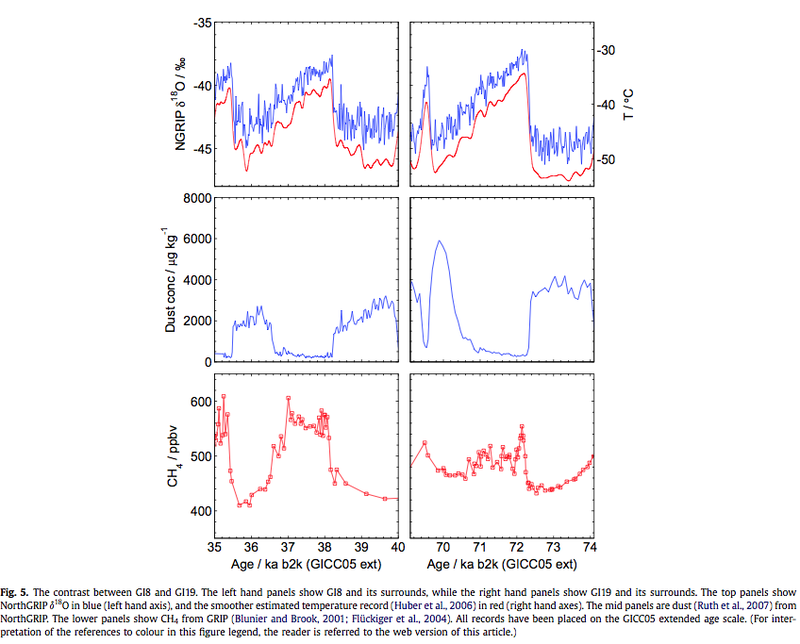 In all four cases, observations are consistent with a classic Northern Hemisphere summer insolation intensity trigger for an initial retreat of northern ice sheets. This is similar to Northern Hemisphere forcing of climatic cycles in Antarctica over the past 360,000 years, Kawamura et al (2007) – not cited here because they didn’t make a statement about “the problem so far”. Orbital forcing of the climate system is clearly shown in the Earths record of glacial–interglacial cycles, but the mechanism underlying this forcing is poorly understood. Not sure whether this is classified as “Still a mystery” or Theory B or Theory C Family. During the Late Pleistocene, the period of glacial-to-interglacial transitions (or terminations) has increased relative to the Early Pleistocene [~100 thousand years (ky) versus 40 ky]. A coherent explanation for this shift still eludes paleoclimatologists (3). Although many different models have been proposed (4), the most widely accepted one invokes changes in the intensity of high-latitude Northern Hemisphere summer insolation (NHSI). These changes are driven largely by the precession of the equinoxes (5), which produces relatively large seasonal and hemispheric insolation intensity anomalies as the month of perihelion shifts through its ~23-ky cycle. Their “widely accepted” theory is from the Theory C Family. This is a different theory from the “widely accepted” theory B. Perhaps both are “widely accepted”, hopefully by different groups of scientists. The origin of the 100 kyr cyclicity, which dominates ice volume variations and other climate records over the past million years, remains debatable..
..One of the major challenges to the classical Milankovitch theory is the presence of 100 kyr cycles that dominate global ice volume and climate variability over the past million years (Hays et al., 1976; Imbrie et al., 1993; Paillard, 2001). This periodicity is practically absent in the principal “Milankovitch forcing” – variations of summer insolation at high latitudes of the Northern Hemisphere (NH). The eccentricity of Earth’s orbit does contain periodicities close to 100 kyr and the robust phase relationship between glacial cycles and 100-kyr eccentricity cycles has been found in the paleoclimate records (Hays et al., 1976; Berger et al., 2005; Lisiecki, 2010). However, the direct effect of the eccentricity on Earth’s global energy balance is very small. Moreover, eccentricity variations are dominated by a 400 kyr cycle which is also seen in some older geological records (e.g. Zachos et al., 1997), but is practically absent in the frequency spectrum of the ice volume variations for the last million years. In view of this long-standing problem, it was proposed that the 100 kyr cycles do not originate directly from the orbital forcing but rather represent internal oscillations in the climate-cryosphere (Gildor and Tziperman, 2001) or climate-cryosphere-carbonosphere system (e.g. Saltzman and Maasch, 1988; Paillard and Parrenin, 2004), which can be synchronized (phase locked) to the orbital forcing (Tziperman et al., 2006). Alternatively, it was proposed that the 100 kyr cycles result from the terminations of ice sheet buildup by each second or third obliquity cycle (Huybers and Wunsch, 2005) or each fourth or fifth precessional cycle (Ridgwell et al., 1999) or they originate directly from a strong, nonlinear, climate-cryosphere system response to a combination of precessional and obliquity components of the orbital forcing (Paillard, 1998). This is not to say that all important questions have been answered. In fact, one purpose of this article is to contribute to the solution of one of the remaining major problems: the origin and history of the 100,000-year climatic cycle. At least over the past 600,000 years, almost all climatic records are dominated by variance components in a narrow frequency band centered near a 100,000-year cycle (5-8, 12, 21, 38). Yet a climatic response at these frequencies is not predicted by the Milankovitch version of the astronomical theory – or any other version that involves a linear response (5, 6). The goal of our modeling effort has been to simulate the climatic response to orbital variations over the past 500 kyrs. The resulting model fails to simulate four important aspects of this record. It fails to produce sufficient 100k power; it produces too much 23K and 19K power; it produces too much 413k power and it loses its match with the record ardoun the time of the last 413k eccentricity minimum..
All of these failures are related to a fundamental shortcoming in the generation of 100k power.. Indeed it is possible that no function will yield a good simulation of the entire 500 kyr record under consideration here, because nonorbitally forced high-frequency fluctuations may have caused the system to flip or flop in an unpredictable fashion. This would be an example of Lorenz’s concept of an almost intransitive system..
..Progress in this direction will indicate what long-term variations need to be explained within the framework of a stochastic model and provide a basis for estimating the degree of unpredictability in climate. It is now widely believed that these astronomical influences, through their control of the seasonal and latitudinal distribution of incident solar radiation, either drive the major climate cycles externally or set the phase of oscillations that are driven internally.. ..In this paper we concentrate on the 23-kyr and 41- kyr cycles of glaciation. These prove to be so strongly correlated with large changes in seasonal radiation that we regard them as continuous, essentially linear responses to the Milankovitch forcing. In a subsequent paper we will remove these linearly forced components from each time series and examine the residual response. The residual response is dominated by a 100-kyr cycle, which has twice the amplitude of the 23- and 41-kyr cycles combined. In the band of periods near 100 kyr, variations in radiation correlated with climate are so small, compared with variations correlated with the two shorter climatic cycles, that the strength of the 100-kyr climate cycle must result from the channeling of energy into this band by mechanisms operating within the climate system itself. 1. One difficulty in finding a simple Milankovitch explanation is that the amplitudes of all 100-kyr radiation signals are very small [Hays et al., 1976]. As an example, the amplitude of the 100-kyr radiation cycle at June 65N (a signal often used as a forcing in Milankovitch theories) is only 2W/m² (Figure 1). This is 1 order of magnitude smaller than the same insolation signal in the 23- and 41- kyr bands, yet the system’s response in these two bands combined has about half the amplitude observed at 100 kyr. 2. Another fundamental difficulty is that variations in eccentricity are not confined to periods near 100 kyr. In fact, during the late Pleistocene, eccentricity variations at periods near 100 kyr are of the same order of magnitude as those at 413 kyr.. yet the d18O record for this time interval has no corresponding spectral peak near 400 kyr..
3. The high coherency observed between 100 kyr eccentricity and d18O signals is an average that hides significant mismatches, notably about 400 kyrs ago. In our model, the coupled system acts as a nonlinear amplifier that is particularly sensitive to eccentricity-driven modulations in the 23,000-year sea level cycle. During an interval when sea level is forced upward from a major low stand by a Milankovitch response acting either alone or in combination with an internally driven, higher-frequency process, ice sheets grounded on continental shelves become unstable, mass wasting accelerates, and the resulting deglaciation sets the phase of one wave in the train of 100 kyr oscillations. This doesn’t really appear to be Theory B. The growth and decay of terrestrial ice sheets during the Quaternary ultimately result from the effects of changes in Earth’s orbital geometry on climate system processes. This link is convincingly established by Hays et al. (1976) who find a correlation between variations of terrestrial ice volume and variations in Earth’s orbital eccentricity, obliquity, and longitude of the perihelion. Hays et al 1976. Theory B with no support. We can conclude that the standard Milankovitch insolation theory does not account for the terminations of the ice ages. That is a serious and disturbing conclusion by itself. We can conclude that models that attribute the terminations to large insolation peaks (or, equivalently, to peaks in the precession parameter), such as the recent one by Raymo (23), are incompatible with the observations. I’ll take this as “Still a mystery”. Through the spectral analyses of marine oxygen isotope (d18O) records it has been shown that ice-sheets respond both linearly and non-linearly to astronomical forcing. The theory finds support in the fact that the spectra of the d18O records contain some of the same frequencies as the astronomical variations (2– 4), but a satisfactory explanation of how the changes in orbital eccentricity are transformed into the 100-ky quasi-periodic fluctuations in global ice volume indicated by the data has not yet been found (5). Evidence from power spectra of deep-sea oxygen isotope time series suggests that the climate system of Earth responds nonlinearly to astronomical forcing by frequency modulating eccentricity-related variations in insolation. With the help of a simple model, it is shown that frequency modulation of the approximate 100,000-year eccentricity cycles by the 413,000-year component accounts for the variable duration of the ice ages, the multiple-peak character of the time series spectra, and the notorious absence of significant spectral amplitude at the 413,000-year period. The observed spectra are consistent with the classic Milankovitch theories of insolation.. So if we consider the 3 references the provide in support of the “astronomical hypothesis”, the latest one says that a solution to the 100 kyr problem has not yet been found – of course this 1999 paper gives it their own best shot. Rial (1999) clearly doesn’t think that Imbrie et al 1992 / 1993 solved the problem. And, of course, Rial (1999) proposes a different solution to Imbrie et al 1992/1993. However, the linear response cannot appropriately account for the 100 kyr periodicity (Hays et al. 1976). Ghil (1994) explained the appearance of the 100 kyr periodicity as a nonlinear resonance to the combination tone 1/109 kyr-1 between precessional frequencies 1/19 and 1/23 kyr-1. Contrary to the linear resonance, the nonlinear resonance can occur even if the forcing frequencies are far from the internal frequency of the response system. Benzi et al. (1982) proposed stochastic resonance as a mechanism of the 100 kyr periodicity, where the response to small external forcing is amplified by the effect of noise. Tziperman et al. (2006) proposed that the timing of deglaciations is set by the astronomical forcing via the phase- locking mechanism.. De Saedeleer et al. (2013) suggested generalized synchronization (GS) to describe the relation between the glacial cycles and the astronomical forcing. GS means that there is a functional relation between the climate state and the state of the astronomical forcing. They also showed that the functional relation may not be unique for a certain model. However, the nature of the relation remains to be elucidated. According to the Milankovitch theory, the 100 kyr glacial cycle is caused by changes in insolation (solar heating) brought about by variations in the eccentricity of the Earth’s orbit. There are serious difficulties with this theory: the insolation variations appear to be too small to drive the cycles and a strong 400 kyr modulation predicted by the theory is not present..
We suggest that a radical solution is necessary to solve these problems, and we propose that the 100 kyr glacial cycle is caused, not by eccentricity, but by a previously ignored parameter: the orbital inclination, the tilt of the Earth’s orbital plane..
“Still a mystery”, with the new solution of a member of the Theory C Family. The main variations of ice volume of the last million years can be explained from orbital parameters by assuming climate oscillates between two states: glaciations and deglaciations (Parrenin and Paillard, 2003; Imbrie et al., 2011) (or terminations). An additional combination of ice volume and orbital parameters seems to form the trigger of a deglaciation, while only orbital parameters seem to play a role in the triggering of glaciations. Here we present an optimized conceptual model which realistically reproduce ice volume variations during the past million years and in partic- ular the timing of the 11 canonical terminations. We show that our model looses sensitivity to initial conditions only after ∼ 200 kyr at maximum: the ice volume observations form a strong attractor. Both obliquity and precession seem necessary to reproduce all 11 terminations and both seem to play approximately the same role. Note that eccentricity variations are not cited as the cause. Although we find astronomical frequencies in almost all paleoclimatic records [1,2], it is clear that the climatic system does not respond linearly to insolation variations . The first well-known paradox of the astronomical theory of climate is the ‘100 kyr problem’: the largest variations over the past million years occurred approximately every 100 kyr, but the amplitude of the insolation signal at this frequency is not significant. Although this problem remains puzzling in many respects, multiple equilibria and thresholds in the climate system seem to be key notions to explain this paradoxical frequency. To explain these paradoxical amplitude and phase modulations, we suggest here that deglaciations started when a combination of insolation and ice volume was large enough. To illustrate this new idea, we present a simple conceptual model that simulates the sea level curve of the past million years with very realistic amplitude modulations, and with good phase modulations. Numerous studies have demonstrated that Pleistocene glacial cycles are linked to cyclic changes in Earth’s orbital parameters (Hays et al., 1976; Imbrie et al., 1992; Lisiecki and Raymo, 2007); however, many questions remain about how orbital cycles in insolation produce the observed climate response. The most contentious problem is why late Pleistocene climate records are dominated by 100-kyr cyclicity. Insolation changes are dominated by 41-kyr obliquity and 23-kyr precession cycles whereas the 100-kyr eccentricity cycle produces negligible 100-kyr power in seasonal or mean annual insolation. Thus, various studies have proposed that 100-kyr glacial cycles are a response to the eccentricity-driven modulation of precession (Raymo, 1997; Lisiecki, 2010b), bundling of obliquity cycles (Huybers and Wunsch, 2005; Liu et al., 2008), and/or internal oscillations (Saltzman et al., 1984; Gildor and Tziperman, 2000; Toggweiler, 2008). We present a new, phase-space model of Pleistocene ice volume that generates 100-kyr cycles in the Late Pleistocene as a response to obliquity and precession forcing. Like Parrenin and Paillard, (2003), we use a threshold for glacial terminations. However, ours is a phase-space threshold: a function of ice volume and its rate of change. Our model the ﬁrst to produce an orbitally driven increase in 100-kyr power during the mid-Pleistocene transition without any change in model parameters. Theory C Family – two (relatively) new papers (2003 & 2011) with similar theories are presented as support of the astronomical theory causing the ice ages. Note that the theory in Imbrie et al 2013 is not the 100 kyr eccentricity variation proposed by Hays, Imbrie and Shackleton 1976. The processes and feedbacks responsible for the 100-kyr cycle of Late Pleistocene global climate change are still being debated. This paper presents a numerical model that integrates (1) long-wavelength outgoing radiation, (2) the ice-albedo feedback, and (3) lithospheric deflection within the simple conceptual framework of coherence resonance. Coherence resonance is a dynamical process that results in the amplification of internally generated variability at particular periods in a system with bistability and delay feedback.. ..The 100-kyr cycle is a free oscillation in the model, present even in the absence of external forcing. “Still a mystery” – with the new solution that is not astronomical forcing. All serious students of Earth’s climate history have heard of the ‘‘100 kyr problem’’ of Milankovitch orbital theory, namely the lack of an obvious explanation of the dominant 100 kyr periodicity in climate records of the last 800,000 years. Global ice volume proxy records obtained from deep-sea sediment cores, when analyzed in this way produce a narrow peak corresponding to a period of ~100 kyr that dominates the low frequency part of the spectrum. This contrasts with the spectrum of orbital eccentricity variation, often assumed to be the main candidate to pace the glaciations [Hays et al 1980], which shows two distinct peaks near 100 kyr and substantial power near the 413 kyr period. Milankovitch theory seeks to explain the Quaternary glaciations via changes in seasonal insolation caused by periodic changes in the Earth’s obliquity, orbital precession and eccentricity. However, recent high-resolution spectral analysis of d18O proxy climate records have cast doubt on the theory.. Here we show that the spectral signature of d18O records are entirely consistent with Milankovitch mechanisms in which deglaciations are triggered every fourth or fifth precessional cycle. Such mechanisms may involve the buildup of excess ice due to low summertime insolation at the previous precessional high. So they don’t accept Theory B. They don’t claim the theory has been previously solved and they introduce a Theory C Family. The Milankovitch hypothesis is widely held to be one of the cornerstones of climate science. Surprisingly, the hypothesis remains not clearly defined despite an extensive body of research on the link between global ice volume and insolation changes arising from variations in the Earth’s orbit. The Milankovitch hypothesis as formulated here does not explain the large rapid deglaciations that occurred at the end of some of the ice age cycles. Was it still a mystery or just not well defined. And from his new work, I’m not sure whether that means he thinks he has solved the reason for some ice age terminations, or that terminations are still a mystery. So the Hays, Imbrie & Shackleton 1976 Theory B is not correct. Hence, the 100,000-year cycle does not arise from ice sheet dynamics; instead, it is probably the response of the global carbon cycle that generates the eccentricity signal by causing changes in atmospheric carbon dioxide concentration. Note that this is in opposition to the papers by Imbrie et al (2011) and Parrenin & Paillard (2003) that were cited by Parrenin & Paillard (2012) in support of the astronomical theory of the ice ages. Hays et al. established that Milankovitch forcing (i.e., variations in orbital parameters and their effect on the insolation at the top of the atmosphere) plays a role in glacial cycle dynamics. However, precisely what that role is, and what is meant by ‘‘Milankovitch theories’’ remains unclear despite decades of work on the subject [e.g., Wunsch, 2004; Rial and Anaclerio, 2000]. Current views vary from the inference that Milankovitch variations in insolation drives the glacial cycle (i.e., the cycles would not exist without Milankovitch variations), to the Milankovitch forcing causing only weak climate perturbations superimposed on the glacial cycles. A further possibility is that the primary influence of the Milankovitch forcing is to set the frequency and phase of the cycles (e.g., controlling the timing of glacial terminations or of glacial inceptions). In the latter case, glacial cycles would exist even in the absence of the insolation changes, but with different timing. “Still a mystery” – but now solved with a Theory C Family (in their paper). The so-called Milankovitch hypothesis, that much of inferred past climate change is a response to near- periodic variations in the earth’s position and orientation relative to the sun, has attracted a great deal of attention. Numerous textbooks (e.g., Bradley, 1999; Wilson et al., 2000; Ruddiman, 2001) of varying levels and sophistication all tell the reader that the insolation changes are a major element controlling climate on time scales beyond about 10,000 years. A recent paper begins ‘‘It is widely accepted that climate variability on timescales of 10 kyrs to 10 kyrs is driven primarily by orbital, or so-called Milankovitch, forcing.’’ (McDermott et al., 2001). To a large extent, embrace of the Milankovitch hypothesis can be traced to the pioneering work of Hays et al. (1976), who showed, convincingly, that the expected astronomical periods were visible in deep-sea core records.. ..The long-standing question of how the slight Milankovitch forcing could possibly force such an enormous glacial–interglacial change is then answered by concluding that it does not do so. “Still a mystery” – Wunsch does not accept Theory B and in this year didn’t accept Theory C Family (later co-authors a Theory C Family paper with Huybers). I cited this before in Part Six – “Hypotheses Abound”. Climate variations of the last 3 million years are characterized by glacial-interglacial cycles which are generally believed to be driven by astronomically induced insolation changes. No citation for the claim. Of course I agree that it is “generally believed”. Is this theory B? Or theory C? Or not sure? Out of about 300 papers checked, I found 34 papers (I might have missed a few) with a statement on the major cause of the ice ages separate from what they attempted to prove in their paper. These 34 papers were reviewed, with a further handful of cited papers examined to see what support they offered for the claim of the paper in question. I have question marks over my own classification of about 10 of these because they lack clarity on what they believe is the situation to date. Of course, from the point of view of the papers reviewed each believes they have some solution for the mystery. That’s not primarily what I was interested in. I wanted to see what all papers accept as the story so far, and what evidence they bring for this belief. I found only one paper claiming theory B that attempted to produce any significant evidence in support. Hays, Imbrie & Shackleton (1976) did not prove Theory B. They suggested it. Invoking “probably non-linearity” does not constitute proof for an apparent frequency correlation. Specifically, half an apparent frequency correlation – given that eccentricity has a 413 kyr component as well as a 100 kyr component. Some physical mechanism is necessary. Of course, I’m certain Hays, Imbrie & Shackleton understood this (I’ve read many of their later papers). Of the papers we reviewed, over half indicate that the solution is still a mystery. That is fine. I agree it is a mystery. Some papers indicate that the theory is widely believed but not necessarily that they do. That’s probably fine. Although it is confusing for non-specialist readers of their paper. Some papers cite Hays et al 1976 as support for theory B. This is amazing. Some papers claim “astronomical forcing” and in support cite Hays et al 1976 plus a paper with a different theory from the Theory C Family. This is also amazing. Some papers cite support for Theory C Family – an astronomical theory to explain the ice ages with a different theory than Hays et al 1976. Sometimes their cited papers align. However, between papers that accept something in the Theory C Family there is no consensus on which version of Theory C Family, and obviously therefore, on the papers which support it. How can papers cite Hays et al for support of the astronomical theory of ice age inception/termination? Really? Newton didn’t actually prove it in his paper? Oh, you know what, I just had a quick look at the last few papers in my field and copied their citations so I could get on with putting forward my theory. Come on, we all know the sun rises every day, look out the window (unless you live in England). Anyway, so glad you called, let me explain my new theory, it solves all those other problems, I’ve really got something here..
Well, that might be part of the answer. It isn’t excusable, but introductions don’t have the focus they should have. Why the Belief in Theory B? This part I can’t answer. Lots of people have put forward theories, none is generally accepted. The reason for the ice age terminations is unknown. Or known by a few people and not yet accepted by the climate science community. Is it ok to accept something that everyone else seems to believe even though they all actually have a different theory. Is it ok to accept something as proven that is not really proven because it is from a famous paper with 2500 citations? Finally, the fact that most papers have some vague words at the start about the “orbital” or “astronomical” theory for the ice ages doesn’t mean that this theory has any support. Being scientific, being skeptical, means asking for evidence and definitely not accepting an idea just because “everyone else” appears to accept it. I am sure people will take issue with me. In another blog I was told that scientists were just “dotting the i’s and crossing the t’s” and none of this was seriously in doubt. Apparently, I was following creationist tactics of selective and out-of-context quoting..
Well, I will be delighted and no doubt entertained to read these comments, but don’t forget to provide evidence for the astronomical theory of the ice ages. Note 1: The temperature fluctuations measured in Antarctica are a lot smaller than Greenland but still significant and still present for similar periods. There are also some technical challenges with calculating the temperature change in Antarctica (the relationship between d18O and local temperature) that have been better resolved in Greenland. Google search gave this link to a manuscript of the 1988 article of Berger. My access to the journal articles starts from 1996 for some reason. Thanks Pekka, I’m having a read. Google Scholar didn’t find it, did you just look via vanilla Google? Often a filetype:pdf search will turn up something additional. Although not in this case. Pekka is a better searcher than I, at least in this instance. I used vanilla Google in that. It may have a better coverage of some sources. As far as remember, I searched by Berger 1988 and the full title (possibly in double quotes), and got the link on the first page among various references to the article. I see you have finally gotten around to looking at something relevant to climate science. Good for you. Great read taking us through the looking glass. My initial hunch is that the first step to unwinding this problem is to separate core age dating from orbital cycle ages. The upshot is unaffected, but exploring those papers in date order might have been a bit more useful in terms of understanding the evolution in thinking. Re the general issue, what we’re seeing here is a collective judgement that, after 40 years of trying, no one has been able to come up with a proposal that doesn’t involve at least a key role for orbital forcing. The exact mechanism may be unknown as yet, but I think more weight can be placed on that judgement than you seem to want to. It occurs to me: What modeling has been done of an Earth without orbital forcing? Is there even an ENSO, to say nothing of any sign of a longer-term large-scale internal oscillation capable of driving glaciations? While no expert, I think the role of the initial CO2 response to the deglacial signal is likely at least part of the key to explaining the mechanism. There’s a line of research relating to that; see e.g. here. A couple of proposed alternative mechanisms are noted in the WG1 discussion, but the shifting southerly winds one seems to be the most parsimonious (again IMO) although not necessarily the only one in play. There’s some deep-time work showing an apparent orbital cycle signature during times of no glaciation at all. I haven’t read it, but this seems of interest in that regard. The recent Lake E and ANDRILL results detailing climate changes during the mid-Pliocene (a time of much-reduced glaciation relative to present) also seem worth considering. I also saw a recent modeling paper proposing that with background CO2 levels continuing to drop, we are (or would have been anyway) on the verge of a further shift (analogous to the MPT) into a deeper glacial state with much larger ice sheets. We can place all the weight we like on it. “The growth and decay of terrestrial ice sheets during the Quaternary ultimately result from the effects of changes in Earth’s orbital geometry on climate system processes. This link is convincingly established by Hays et al. (1976).. When this link as far as theory B is concerned was not convincingly established at all. I might be less critical of them. Although of course the statement isn’t actually true so I would be critical of that part. Many papers have come up with simple models that produce periods around 100kyr from internal modes of oscillations. They are very simple models, though. An alternative way to look at the past 40 years of trying is that 95% of the effort has gone into finding reasons for glacial terminations in orbital forcing and has not been able to come up with anything at all resembling a theory with physics, and 5% has gone into investigating other mechanisms. Given the lack of success with all this effort it appears that perhaps the next 40 years should be spent in “other mechanisms”. But that’s just an opinion of mine. The question is not really about opinions, but about what can be demonstrated, what can be put forward as a hypothesis to be tested, and what is unknown. The orbital theory of ice age inception and termination is a hypothesis to be tested. It has not been demonstrated. Many people have put forward different theories of ice age termination. Opposing theories don’t add up to “more support” for the orbital hypothesis, they add up to “less support”. Most of them do not use eccentricity variations as their basis – the reason being that it is extremely difficult to come up with such a theory, and none of the theories in the eccentricity category – as far as I have been able to find – have even attempted to deal with the problem I identify in the article (under “Why Theory B is Unsupportable”). However, the frequency “match” between ice age terminations and eccentricity variations is in fact one key basis for the belief that this relationship exists. The second key basis is that orbital forcing appears to explain 20k and 40k variations in ice sheets so it’s natural to look for orbital forcing to explain the most important part of ice age history. But there is no a priori reason to expect to find it in orbital forcing. I will throw out an opinion that there is a third basis for the belief in this relationship. It’s my opinion and, therefore, worth very little – The third basis for focusing on orbital forcing is an unstated one, but appears to pervade a lot of climate science. And that is that we need some kind of “external forcing” to explain anything beyond a steady state (where steady state includes lots of natural oscillations that ultimately only move heat around in time or in space through the climate system). I will return to this point in a separate series where I will attempt to present more than an opinion. It’s a very good question that deserves a longer answer than I put forward below. Modeling the climate systems on long time scales is a technical challenge due to computing power. We had a look at many models (with orbital forcing) from Part Seven – GCM I through to Twelve – GCM V – Ice Age Termination. Earth models of intermediate complexity (EMICs) were also considered in one of these articles. EMICs offer the potential to bridge the gap between energy balance models and GCMs for long time periods. Unfortunately they also suffer from a serious deficiency, which is why GCMs exist. The deficiency is they lack physics of key parts of the climate and you run them with lots of different parameters to get the result you want and then try and figure out what that means. My shorthand version of EMICs. Did you run the same ORB simulation at earlier times of higher insolation in the NH high latitudes – e.g. 104, 83 or 67 kyrs? Given the smaller ice sheets and lower GHGs surely the effects would be greater than those simulated at 20 kyrs? My interest here was specifically because the results of the “modeled deglaciation” would surely have happened long before “the right time” if only someone had run the model at earlier times of higher insolation. In fact, the best test of a theory is to try to make the theory fail. And this is an obvious place where that specific theory probably fails. Not done because it is not a funded project. Is anyone really interested in this topic? I wonder.. But I will return to this topic for the longer answer with a series (probably to be) called Natural Variation and Chaos, watch this space. I think it was at one time, and even now I don’t think it’s excludable (although other things would have to be modulating it), but in any case AFAICT the most powerful evidence for paleos is the relatively neat pre-MPT correlation. It certainly is for me. So if indeed something non-orbital is going on to pace things post-MPT, it seems that it would have to have started at the MPT (no prior evidence for it, right? ), presumably because of a tipping point being crossed consequent to a slight change in background CO2, then have somehow canceled out the effect of the orbital forcing and started driving glaciations all by itself? Wow (tm Judy Curry). If on the other hand you’re suggesting that it’s just modulating orbital forcing, well… how not? Can you point to what you think is the most credible of those simple model results, BTW? TIA. I should add, re the NSF, and of course from what I can see, that they’re quite focused these days on paleo news they can use. Science related to the general mechanism underlying the timing of the once-and-now-not-so-future post-MPT glaciations doesn’t quality too well. Studying the LGM, the most recent deglacial, the mid-Pliocene, the PETM and similar fills the bill rather better, and I suspect that research funds are pretty limited even within those narrowed confines. But we may hope for incidental results even so. The pre-MPT is a good point to consider. I believe that if the last 2.5M year climate history (therefore including the pre-MPT time period), along with the abrupt (millennial / centennial) climate change found in Greenland and Antarctic ice cores, along with the large swings in CO2, CH4 plus the 25x change in dust lining up with glacial maximums – had all been available information on the day in the mid-1970s then no one would have ever come up with an eccentricity hypothesis in 1976 to explain ice age terminations. That’s just an opinion – how it seems from the history, and from reading lots of the older papers. I don’t know how to evaluate credibility for them. They illustrate a point. What to do next is not something I am clear about. Here we consider the possibility that Milankovitch forcing could affect the phase of the glacial cycles via a mechanism known as ‘‘nonlinear phase locking,’’ follow- ing the pioneering work on the role of phase locking to Milankovitch forcing by Saltzman and collaborators [e.g., Saltzman et al., 1984] and as more specifically proposed by Gildor and Tziperman . We describe the nonlinear phase locking mechanism and show how it could permit Milankovitch forcing to ‘‘pace’’ the glacial cycles. These ideas are demonstrated using a simple model of the glacial cycles. Our main message, however, is that the timing of the major deglaciations can be set by Milankovitch forcing nearly independent of the specific mechanism (or model) that is responsible for these cycles. Thus distinguishing between different models by their fit to the ice volume proxy record is therefore difficult. ‘‘Nonlinear phase locking’’ may be briefly summarized with the help of Figure 1b which shows time series of land ice volume from two model runs starting from two different initial conditions. In the presence of Milankovitch forcing (affecting ablation in the model), the glacial cycle phase (e.g., termination times) is independent of the initial conditions of the climate system after some initial adjustment period. The purpose of this paper is to examine the case for nonlinear phase locking setting the phase of the glacial cycles and to study some of the consequences of this hypothesis. A condition for the phase locking mechanism to work is that the 100 kyr cycles are the result of some nonlinear process of very general type. We will show that the phase locking mechanism can explain why very different physical mechanisms and models [e.g., Pollard, 1982; Berger and Loutre, 1996; Saltzman et al., 1984; Hyde and Peltier, 1987; Maasch and Saltzman, 1990; Saltzman and Verbitsky, 1994; Paillard, 1998; Gildor and Tziperman, 2000; Ashkenazy and Tziperman, 2004; Huybers and Wunsch, 2005] are all able to produce a good fit to the observed ice volume record. A consequence of the efficiency of nonlinear phase locking in many different models is that it is too simple to obtain a good fit to SPECMAP-like records [Imbrie et al., 1984] by including Milankovitch forcing in a given model. We therefore emphasize that obtaining such a fit by a given model (including the highly idealized and unrealistic model used here) is not necessarily an indication that the glacial mechanism represented by this model is correct. Huybers & Wunsch (2005), later developed a bit further by Huybers (2007), basically demonstrates a very good statistical test (disclaimer: my stats is bad and plus I have some fundamental questions about stats in non-linear systems that make me wonder about stats in climate..) for obliquity being a necessary condition for a deglaciation. Interestingly, it isn’t an absolute. That is, some deglaciations fail the test. Well, I definitely recommend reading Huybers 2007. Out of all the papers on orbital hypotheses, this is one of the few that doesn’t appear to shoehorn terminations into some kind of “post hoc” description. ..should just add to the Huybers 2007 comment because it’s probably one of the most important points – most obliquity cycles don’t have an ice age termination. Therefore, obliquity does not cause a termination. It is a “mostly necessary condition” in my paraphrase of the hypothesis. SoD that was a very entertaining and informative post, thanks. I feel like you took one for the team in reading through all those papers. This is almost exactly how I was reading the situation (although articulated better). I don’t know if that was picked up from your comments on each paper or the best explanation for the knots authors seemed to tie themselves in. It all reminds me of a similar example in a completely different science field. Some of the first HIV vaccines were based on the viral protein GP120. These went through clinical trials but ended up with lacklustre data. Since then numerous variants of the GP120(GP140) vaccine have been developed and gone through early stage testing. Each paper describing these new vaccines describe GP120 as the lead vaccine molecule, list the shortcomings of numerous earlier variants of the molecule and go on the describe the potential in their own version (only to present their own very ordinary data). This has been going on since the early 90’s but through all the failure it seems GP120 has never stopped being described as the best hope. Really enjoyed the way you have analysed all this data, really huge effort and very interesting! I’m not sure I understand entirely what you mean. Are you suggesting there is some sort of natural oscillation that would give rise to the termination of anIce age? If the ice age is the ‘steady state’ and the ‘event’ (or events? Maybe there are lots of causes for a termination) makes the termination, how can that be something internal? I guess it is difficult to imgaine how this could work, so in my imagination the big changes in a termination would need to be driven by an external forcing. The changes are so assymetric – gradual slide into ice age, rapid out of ice age. It is difficult to explain in a few paragraphs, more opportunity to discuss this when I start the promised series. Hands up, everyone who believes in non-linearity.. ok great, everyone’s hand is up. But the test of what people really believe about non-linearity is clear in many comments, most people in practice don’t expect non-linearity and appear to assume linearity – by the way this suggestion is not directed at you. It is just that I have observed it, and consequently want to lay out a few hypotheses so readers can attack, defend or say “you haven’t really understood what I was saying”. That is the problem with unstated beliefs. They are unstated. Alternatively, I have missed the point and think there is a flawed unstated belief, when it’s me that has missed something basic. All possible, and the only way to pick through these options and all learn something is to spell out some ideas in stark form and generate some discussion. Onto your question, which I attempt briefly to explain. There is a nice example of how non-linear climate is in Part Five – Back of the envelope calcs from Pierrehumbert around a 1995 paper by the well-known climate skeptic Prof. Raymond T. Pierrehumbert. In his paper we see a simple example of how changing circulation patterns could cause very significant changes in OLR without any change in solar insolation or GHGs (it’s a 2-box teaching model in the style beloved of physics professors). In the Hays et al 1976 paper that so many cite as demonstration of Theory B, we see a potential 0.1% increase in solar insolation as starting and ending ice ages – via non-linear amplification of, as yet, unknown origin. In Hays et al 1976 which just about everyone (including me) accepts as an actual demonstration of Theory A, we see that zero annual global change in solar insolation causes significant changes in the size of ice sheets – simply by significant latitudinal shifts and seasonal shifts in insolation. In actual climate records we see large changes between Antarctica and Greenland happening very quickly and lasting more than 1000 years, and causing, or impacting, or being caused by, large CH4 and dust changes. What then is so amazing about the idea that climate variations not caused by solar insolation forcing (or anthropogenic emissions of GHGs) can occur over short and long periods. Most dynamic systems with periodic forcing and non-linear interactions produce very strange behaviors that would not be expected until the equations are either examined in the phase space (ie people who understand non-linear dynamics apply well-trodden paths to get a conceptual understanding of them) or have numerical analysis done to see the long term results. This is independent of any idea of chaos or not. Non-linear systems produce “unexpected” results. All kinds of oscillations, amplifications and multiple modes. ..so in my imagination the big changes in a termination would need to be driven by an external forcing. I hope to illustrate the complete lack of difference as far as the climate is concerned between an “external” forcing and the internal dynamics. Could you imagine – before you saw it – the climate oscillations, not caused by orbital forcing or anthropogenic GHGs, seen in the polar regions? The changes are so assymetric – gradual slide into ice age, rapid out of ice age. My working hypothesis has been inspired by DeWitt Payne – the climate’s natural state is glaciation. So it easily slips into this. It takes something significant to create a termination – that’s the question, how does this happen? I can’t demonstrate much evidence at this stage, other than the short time period of an interglacial and the long continual slide deeper and deeper into a glacial. To me it does not seem to be the case that the Earth has two stable states, but that it has two persistent modes: glaciation and deglaciation. The states of glacial maximum and interglacial seem to be unstable and of very short duration on the geological time scale. So, if this is true, it is something to think about. The natural state is not static but changing. All without forcing. Incredible. Which brings me back to the start. Why is the unstated belief that the climate, without any “external forcing” is static? Where is the evidence for this? Perhaps it is not believed and everyone is very comfortable with, and just expects, constant change.. Anyway, more than long enough for a comment, long enough to confuse but not long enough to convince anyone of anything. More in a later article. What? The climate’s natural state is ice-free, for the Phanerozoic anyway. And we are headed back to that soon enough (as in several million years, quite soon as these things are measured) as the plate tectonic dispersal phase shifts back into the aggregation phase. The natural state is not static but changing. All without forcing. Incredible. Are you really making that claim for the glacial cycles? I thought you had agreed they’re forced by orbital cycles. Did I miss something? Conceptually, how is the diurnal cycle not a forcing, it being a modulator of insolation just as much as the orbital cycles are. And is plate tectonics not ultimately forced by decay heat? So it would seem important to define terms with great care. I have to say I think this discussion is a little odd given that even as we speak the planet is being driven into unprecedented climate conditions. We’re already well outside whatever envelope of natural variability might have existed before we came along and, pointedly, are already arguing about whether disasters that would previously have been assumed to be wholly natural really still are. What? The climate’s natural state is ice-free, for the Phanerozoic anyway..
To clarify, the climate’s recent natural state, where recent = last 800 kyrs. I suggested that the start and end of ice ages, i.e., the major glacial cycle, was as yet a mystery. I agree with Theory A. But Theory A covers the 20k and 40k time periods – the ups and downs in between glacial inceptions and terminations. They are both forcings. And I agree that defining terms with great care is important. Usually I fail to do this in comments. I don’t think I said anything about current conditions being not unprecedented, or being precedented. And nothing about disasters. ..long enough to confuse but not long enough to convince anyone of anything. Perhaps I should have said nothing. The topic of natural variability is a difficult one. I would like to explain some ideas at a later date and I hope this will bring out the kind of discussion that is necessary. yes, I was trying to make it clear the fault was with my imagination more than anything else. Ok, I can imagine that there are Earth-bound processes that can occur periodically and stir large changes in the polar region. And periodically one of these internal actions can be sufficient to push the Earth into the Interglacial, but the over time it drifts back down to glacial. The assymetry does seem to suggest that (in my imagination and in a handwavy way). yes indeed! And it may not be the same thing each time. The two ‘states’ of climate is also prevalent in geological evidence, with the Earth swinging between Ice-house and Hot-house states over far longer time periods. So like in an Chaotic system you see similar patterns at all scales. I am not a climate scientist (I’m a hydrogeologist) but I didn’t ever think they thought the natural state was unchanging. I imagine that they were simply of the opinion that the natural variation was insufficient to drive the interglacial change. Steve the application of a forcing (by us) is different to ‘natural’ external forcings I would think. So if we add a forcing, that will still drive the climate in a direction, surely. Even if the past glacial terminations weren’t necessarilly driven. Sure, Nathan. I suppose the upshot is that I think finding a non-orbital pacer for the glacial cycles is a non-starter. No one is going to disagree with me, but identifying clearly the sequence of events surrounding the last termination is essential. What is fascinating is that even over the last few years important new information continues to come to light. I commented briefly on Parrenin et al 2013 in Part Eleven. This is the study that finds no detectable lag between the end of the last ice age and CO2 rising. So even in 2013 major ideas on cause and effect are overturned. Shakun et al 2012 demonstrated that the southern hemisphere led the globe out of the last ice age. Until the results of EDML in Antarctica were lined up with NGRIP in Greenland a few years ago (via CH4 records in both cores) the sequence of events for the frequent and substantial polar warmings and cooling (D-O events) were not clear. Even now, as a result of Parrenin et al 2013, we don’t know if perhaps CO2 led the last termination. And no one really understands the cause of the 180-280ppmv rise subsequently. Well, I think we do know that. CO2 is just a gas, so something has to push it. So of course there is *some* lag; whether it’s 3 years or 300 years is a detail. Re the cause of the rise, did you look at the Toggweiler and Russell paper i linked earlier? Regarding Steve’s mention of the switch from ~40ka to 100ka glacial periods, it looks like more land-ice post MPT takes longer to destroy. Is this the obvious consensus? What caused the ice sheets to expand to the point of surviving 100ka instead of the previous ~40ka? Final Question: If we don’t really understand how or if the astronomical changes dictate the timing of glacial cycles, we have no idea when the next ice age would have begun absent human forcings. – the last 400 kyrs – of course, during the last 400 kyrs it might be that we have switched from an 80-90 kyr period to a 110-120 kyr period. Well we have, it might be a trend or it might be random. Only slightly better than “one cycle in a row” kind of trend. I’ll try and take a look at your papers. But wasn’t it entirely closed before the deep glaciations started? Also, bear in mind that significant flow would have stopped well before final closure. To repeat a point I made in another comment, I think the better explanation is a reduction in the background CO2 level. Steve: whatever the cause, the cooling took nearly 2Ma to “stabilize”. I find that interesting in regards to the current debate about ECS. In regard the timing, you are correct. In fact, shoaling started at about 10Ma, but full closure is approximately coincident with increasing ice volume and sea level declines. IMO, the CO2 arguments have a much higher hurdle than changes in ocean circulation and salinity because of the sheer magnitude of the masses involved in the ocean versus atmosphere. Also, well mixed, diluted effects are less likely to instigate changes as compared with the leverage of concentrated mechanisms. Would you rather lay on a bed of nails or a single Clovis Point? This is essentially how insolation works where the overall forcing is unchanged, but is concentrated in a way to have a leveraged effect. Hopefully, the so-called pause (which IMO is a temporary dampening from negative ENSO) will create more interest in getting a better handle on the oceans which IMO are the thermostat of the climate. Howard, could you do me the favor of explaining the relationship between those four papers and the assertions you just made (first and third paragraphs, and also the dynamic equilibrium remark farther up)? I don’t see it off-hand. Or if you have other relevant citations, please provide them. 1st paragraph regarding ECS refers to the wiki 5Ma temp plot where the last ~1Ma looks like we are oscillating about a mean. This relates to the four papers which indicate that larger continental ice sheet volumes (greater extent or height is not clear to me) are responsible for the shift from 40Ka to ~100Ka cycles. I am waving my arms saying this represents a dynamic (oscillating about a mean) equilibrium in response to *whatever* the forcing that launched the current glacial regime starting ~2.6Ma. The 3rd paragraph is a complete armwave regarding my preference for tectonic and ocean circulation forcings/feedbacks over CO2. Conceptually, the atmospheric chemistry is the weakest candidate as compared with tectonic/ocean circulation mechanisms. Due to the effect on upwelling as noted in some of the papers you and I cite below indicate that wind patterns may be a huge factor in altering ocean circulation. Lastly, the fact that AFAIK, there are no ocean models that simulate all of the great cyclical changes in ocean circulation that are measured today. This is reflected in the inability to simulate the so-called pause. Therefore, when numerical models are used to simulate what caused the onset of Pleistocene glaciation and the MPT I find it hard to believe any result that puts CO2 in the driver seat. Of course, this is just more furious arm-waving on my part, so please disregard or take with a salt-block. I’ll close by saying thanks to you Steve and SOD our venerable host, for all the great links to a large pile of very informative papers that open up the huge knowledge gaps associated with Pleistocene glaciation that I had been under the mistaken assumption that was nearly all figured out. Howard, noting that the LGM was very close to the commencement of the termination, I think the idea is that the ice sheets keep expanding until something makes them stop. I don’t know what the paper cited below says about inception, but you might also want to read through it. Re your second question, past behavior gives us some idea even if direct calculations are shaky. IIRC there are at least two competing proposals for when the next inception would have started. SoD, I hadn’t looked at any of this material for several years and so have a bit of catching up to do. I read the Huybers stuff at the time but by now have forgotten the details. I do recall being impressed, but as you note an actual solution to the problem wasn’t quite apparent. I was girding myself to dive back into Huybers’ work, but in first checking through recent references and comparing with your article I noticed that re Abe-Ouchi et al. (2013) you seem to have gotten sidetracked by what were really just a couple of waves to prior work that wasn’t then used in the analysis. From a quick glance, they seem to be making a pretty strong claim. Unfortunately the paper is so recent that there’s nothing in the literature to indicate what the broader field thinks of it. I’ll read it carefully tomorrow, and hopefully you’ll also have a closer look. I agree that the new claims of Abe-Ouchi et al. (2013) are very interesting. I wrote a comment on it in an earlier article. I emailed Ayako Abe-Ouchi with a question in mid January but I didn’t get a reply. Probably trapped in a spam filter somewhere, or a very busy scientist. I read your recent Nature paper with great interest. I write a climate science blog – Science of Doom – and we’ve had a lot of discussion of ice ages due to a number of articles I have written about this subject, e.g. – https://scienceofdoom.com/2014/01/09/ghosts-of-climates-past-eleven-end-of-the-last-ice-age/. The first question I have about your research was about the simulation. When I looked at Smith & Gregory 2012, they ran a 120 kyr simulation using a GCM, but only by reducing the resolution (FAMOUS model) and then speeding up the forcings by a factor of 10. So effectively they got a 100x factor by spatial & temporal resolution. In your paper you have a 400 kyr simulation on 1’x1′ resolution. I don’t have an in depth knowledge of different climate models – is it because of an amazing supercomputer? or some other method? I would like to understand the mechanics of how they did this before digging in further. I have no specialist knowledge of climate models so perhaps it is obvious to specialists? I don’t recall her ever interacting with the public, so the lack of a reply isn’t surprising, but I expect James Annan and/or Jules Hargreaves would be able to tell you. Or perhaps ask Mo Raymo. But possibly the explanation is the snapshot parameterization technique plus the ice sheet model being less computationally expensive than the full GCM. Oh, and see this new paper claiming to have solved the transition. The researchers seem legit, but the journal looks like one of “those” and if so the editing and peer review may not have been the best. I lack the skill set to critique their analysis. Oh, and see this new paper claiming to have solved the transition..
That link doesn’t have a url. The climate’s natural state is ice-free, for the Phanerozoic anyway. The global temperature during parts of the Phanerozoic was a lot higher than it is now and the geographic distribution of land changed a lot over the period. Most recently there was the Eocene Optimum about 50 million years ago. But the separation of Antarctica from Australia and later South America and, more recently, the closing of the Isthmus of Panama have resulted in the development of icehouse conditions, apparently entirely without a change in external forcing. Some think the formation of the Himalaya’s played a role too by acting as a CO2 scrubber. It’s disingenuous to claim that there was anything normal about the entire ~500 million years of the Phanerozoic era that somehow applies to the current geography of the planet. The Isthmus of Panama is still closed and Antarctica is still separated from any other land mass. It’s unlikely, in my opinion, that the current era of fossil fuel use will result in any permanent change in the global climate, especially not a shift from icehouse to hothouse conditions. The PETM certainly didn’t have a lasting effect. Even the benthic foraminifera eventually recovered. And that happened when the global climate was a lot warmer than it is today. DeWitt, the present deep icehouse state is unquestionably a rarity within the Phanerozoic, and won’t last long. Indeed, the predicted Atlantic subduction zone seems to be in the early stages of formation off Portugal, although net spreading will continue for the time being. I agree that what we’re doing to the physical climate won’t be lasting, although the biological effects look to be much more so. As a general matter, I think you’re way overstating the importance of those seaways relative to reduced CO2 via long-term changes in the balance of volcanism and weathering. The preponderant view seems to be against a major role for the Panama seaway closure, and see this interesting recent paper (press release) re the ACC. Tying these threads together, I think they point to a fairly rapid departure from the deep icehouse, although a remnant Antarctic ice sheet may be able to survive for a considerable time..
“Disingenous” isn’t a nice word, BTW. The problem with the theory that CO2 removal by weathering caused the bulk of the cooling over the last 50 million years is that, as far as we know, there’s no reason for it to stop at ~180 ppmv. If, OTOH, weathering is non-linear with CO2 partial pressure, then peak CO2 from human activity will be lower and decay faster. The circulation change resulting from the closure of the Tethys Ocean, also resulting from the collision between the Indo-Australian Plate and the Eurasian Plate, could well have contributed as much or more to the long plunge into the current icehouse conditions. High CO2 concentration also fails to explain the equable climate problem, at least using current climate models. But an equable climate at high latitudes would, again in my opinion, cause a radiative imbalance between absorption of solar radiation at low latitudes and emission of LW IR at high latitudes leading to a long term cooling. The fact that the rapid glaciation/deglaciation cycles started at about the same time as the closure of the Isthmus of Panama is unlikely to be coincidence. It’s the balance between volcanism and weathering, DeWitt. Re the role of CO2, other things certainly do play a role, but it’s not for nothing that it’s called the Big Control Knob. Re the Panama seaway, are you quite sure you’re up to date on the science? I haven’t checked in on this area of research for a while and will look more, but for now you may find this new paper interesting. Also see the CAS discussion in this recent paper. It seems consistent. Ocean and atmosphere dynamical effects have been suggested as possible causes of some climate change within the Cenozoic era; for example, topographical effects of mountain building , closing of the Panama Seaway  or opening of the Drake Passage . Climate modelling studies with orographic changes confirm significant effects on monsoons and on Eurasian temperature . Modelling studies indicate that closing of the Panama Seaway results in a more intense Atlantic thermohaline circulation, but only small effects on Northern Hemisphere ice sheets . Opening of the Drake Passage surely affected ocean circulation around Antarctica, but efforts to find a significant effect on global temperature have relied on speculation about possible effects on atmospheric CO2 . Overall, there is no strong evidence that dynamical effects are a major direct contributor to Cenozoic global temperature change. Emphasis added. I expect there are more relevant papers, but that does it as far as I’m concerned. This paper is interesting re the Panama seaway, although not relevant to the Plio-Pleistocene. I’m not sure how much is left of this idea if indeed the Drake Passage was substantially blocked until 12 mya, but even so the modeling approach seems sound. Finally, DeWitt, notice my habit if providing links to back up my claims? Please do so too. I like to know that I’m responding to something more than hand-waving. DeWitt, re your point on weathering, based on this paper I think it’s fair to say that glacier loss will reduce weathering since glacial erosion enhances it (by exposing fresh rock surface). The Tibetan Plateau uplift hypothesis was introduced by Raymo and Ruddimann in a 1992 Nature Pater, Tectonic Forcing of Late Cenozoic Climate. This was somewhat controversial then and is still being debated today, so it isn’t received wisdom. I don’t have the reference for what seemed to be the standard response by people who questioned that hypothesis: why did it stop? Looking just now, I found an article in Geology from 2008 by Carmala Garzione, Surface Uplift of Tibet and Cenozoic global cooling that includes more recent data on atmospheric CO2. According to Figure 2 in that paper, the drawdown in atmospheric CO2 was essentially over by 20Ma. That would cast doubt on CO2 as being the cause of cooling since then and specifically the recent deep glaciation/deglaciation cycles. However, there’s Zheng, et.al.,Geology, 2000, Pliocene uplift of the Northern Tibetan Plateau, who think that at least some of the uplift was much more recent. Test. Tried to post a reply twice, and it disappeared. Had two links, though. Steve, Glad you made mention. I found it in the spam and recovered it. For anyone who posts a comment and it disappears please email me at scienceofdoom – you know what goes here – gmail.com. Also explained in Comments and Moderation. have you tested your ‘geography is more important as a climate changer than anything else’ theory? I think to claim that increasing CO2 levels back to where they were in the Jurassic, say, would have a huge impact on global climate, despite no change in geography. From my perspective I can see that what SoD has written here may imply that internal variability (or natural cycles?) could be enormous. Much greater than anyone has anticipated. and that is no comfort, given the forcing we are applying. Indicates that climate change could be worse than expected. SoD, you may have covered this in one of your prior paleo posts, but I wanted to point to DeConto et al. (2012) for a very interesting example of orbital cycles driving periodic major climate changes under hothouse conditions. Random thought: At the start of the Mesozoic day length was only about 23 hours. Could this have had some role in the persistence of the hothouse, possibly by keeping the poles warmer via enhanced circulation? If nothing else, it seems that it would have reduced the diurnal temperature range. Presumably the effects are accounted for in paleo modeling, but I don’t recall seeing any specific reference. The comment of mine that SoD referred to is closely related to the kind of hysteresis the Abe-Ouchi paper is built on. It’s also consistent with the idea of phase-locking. I’m pretty sure the shape of the saw-tooth has led the thinking of the authors of these papers to the same direction it has made me to think. The big question for this line is, what can provide the required very persistent hysteresis. Has Abe-Ouchi et al the right answer, or is the mechanism another one? One of the most recent massive climate change events in earth’s history was the last glacial termination 19-9 thousand years before present (ka BP). Northern Hemisphere ice-sheets receded quickly, causing global sea level to rise by more than 100 m, meltwater was injected into the North Atlantic halting its deepwater formation, atmospheric CO2 concentrations rose by almost 100 ppmv, and the global surface warmed by about 4°C. It is still unresolved what exactly caused this deglacial climate change and ice sheet melting. To address this question, we set out to conduct a series of transient modeling experiments with a coupled 3-dimensional ice-sheet–climate model (iLove). The model includes atmosphere-ocean-sea ice-vegetation components of the intermediate complexity model LOVECLIM and uses bi-directional coupling to the ice-sheet model IcIES. Supporting Milankovitch theory, our results indicate that the deglaciation was initiated by orbital parameter changes. However, according to our model, rising CO2 concentrations after 17 ka BP accelerated the deglaciation. Without this deglacial CO2 increase, large parts of North America and Scandinavia would be covered by ice sheets today. Present sea level would be as much as 100 m lower, and still dropping by about 2.5 m per thousand years due to growing ice sheets. Despite the deglacial CO2-rise and global warming of 4°C, the simulated Greenland ice-sheet only looses about 25% of its volume during the deglaciation, and grows again in the Holocene after 8 ka BP at a rate of about 0.1 m sea level equivalent per thousand years. Our results indicate that the stability of the Greenland ice sheet during the deglaciation and Holocene is supported by changes of the atmospheric stationary wave pattern, and by the deglacial sea ice retreat. Investigation of the roles of different forcings (e.g. orbital variations and greenhouse gases) on climate and sea level requires a paleoclimate chronology with high accuracy. Such a chronology for the past 360 ky was constructed through orbital tuning of O2/N2 ratio of trapped air in the Dome Fuji and Vostok ice cores with local summer insolation (Kawamura et al., 2007). We extend the O2/N2 chronology back to ~500 kyr by analyzing the second Dome Fuji ice core, and find the duration of 11 ka, 5 ka, 9 ka, and 20 ka for MIS 5e, 7e, 9e and 11c interglacial periods in Antarctica, with similar variations in atmospheric CO2. The termination timings are consistent with the rising phase of Northern Hemisphere summer insolation. Marine sediment cores from northern North Atlantic contain millennial-scale signatures in various proxy records (e.g. SST, IRD), including abrupt climatic shifts and bipolar seesaw. Based on the bipolar correlation of millennial-scale events, it is possible to transfer our accurate chronology to marine cores from the North Atlantic. As a first attempt, we correlate the planktonic δ18O and IRD records from the marine core ODP 980 with the ice-core δ18O and CH4 around MIS 11. We find that the durations of interglacial plateaus of planktonic δ18O (proxy for sea surface environments) and benthic δ18O (proxy for ice volume and deep-sea temperature) for MIS 11c are 20 and 15 ka, respectively, which are significantly shorter than originally suggested. These durations are similar to that of Antarctic climate and atmospheric CO2. However, the onsets of interglacial levels in ODP980 for MIS 11 are significantly later than those in Antarctic δ18O and atmospheric CO2 (by as much as ~10 ka), suggesting very long duration (more than one precession cycle) for the complete deglaciation and northern high-latitude warming for Termination V. Atmospheric CO2 may have been the critical forcing for this termination. The long duration of Termination V is consistent with our new ice sheet simulations (extended from the work of Abe-Ouchi et al., 2013) in which an ice-sheet/climate model is forced by insolation and CO2 variations. In the presentation, comparisons for other interglacial periods will also be reported. These can’t be linked to directly, but an abstract search on Abe-Ouchi turns them up. It was a pretty cursory look, so very possibly I missed some other relevant material. A detection of Milankovitch frequencies in tephra records of arc volcanism: Shedding light on a feedback loop between climate and volcanism. Although it is well understood that volcanism can impact global climate or tectonics can influence volcanism, it is less well appreciated that climate can influence volcanism. In this regard, both regional and global studies have provided compelling evidence that ice age loading processes modulate the frequency of volcanic eruption. However, a rigorous detection of Milankovitch periodicities in global volcanic output across the Pleistocene-Holocene ice age, which would firmly establish a connection between ice age climate and eruption frequency, has remained elusive. To this end, we report on a spectral analysis of a large number of well-preserved ash plume deposits recorded in marine sediments along the Pacific Ring of Fire, which accounts for about half of the global length of 44,000 km of active subduction. Eruptions at arc volcanoes tend to be highly explosive. We analyze the Pleistocene-to-Recent marine records of widespread tephras of sub-Plinian to Plinian, and occasionally co-ignimbrite, origin since they provide a well-preserved record of how eruption frequencies varied with depth (and, hence time). Our analysis yields a statistically significant detection of spectral peaks at the obliquity period. We propose that the variability in volcanic activity results from crustal stress changes associated with ice age mass redistribution. In particular, increased volcanism lags behind the highest rate of increasing eustatic sea level (decreasing global ice volume) by 4.0 ± 3.6 kyr and correlates well with numerical predictions of stress changes at volcanically active sites. Our results strongly support the presence of a coupling between ice age climate, volcanism and the continental stress field. In future work we will incorporate longer tephra time series and more accurate age controls in order to improve – and widen – our detection of Milankovitch periodicities thus further elucidating the feedback loop between climate and volcanism as well as tectonics. Hmm, are the deep glaciations in part an accident of geography? This paper implies such, in an interesting way. Reading it with this paper I linked earlier, maybe there is a role for the Central American Seaway closure! Aargh, first link fail: Here. The Mid-Pleistocene Transition (MPT) marked a fundamental change in glacial-interglacial periodicity, transitioning from ~41,000 to 100,000 year cycles, accompanied by higher amplitude climate variability. It occurred without a significant change in orbital forcing, and thus its causes are poorly understood. We report major changes in the pre- and post-MPT mode of the ocean thermohaline circulation (THC), and a THC crisis during the MPT, from Nd isotopes in ODP Sites 1088 (~42S, 2082m) and 1090 (~43S, 3702m). The core locations are at the transition between the South Atlantic and the Southern oceans, a major gateway for the exchange of northern- and southern-sourced water masses. The new data show that in the ‘40-kyr world’ prior to the MPT, NADW export was strong during both interglacials and glacials. At ~900 ka the THC system underwent a major crisis, with an unprecedented weakening in NADW export during Marine Isotope Stages (MIS) 22-24. The recovery of the THC system in the post-MPT ‘100-kyr world’ is characterized by strong THC during interglacials, similar to pre-MPT interglacials, but much weaker THC during glacials. The ‘THC crisis’ interval includes MIS 23, which is unique as an interglacial where the THC operated in the same weak mode as post-MPT glacials. The MIS 22-24 interval has been recognized as a time of abrupt atmospheric pCO2 drawdown (Hoenisch et al. 2009) and significant cooling of ocean deep water, and Antarctic ice sheet expansion (Elderfield et al. Science 2012). Our data indicate that THC changes played an important role as a primary driving force, and helped to generate a series of positive feedbacks. This drastic change in deep-ocean circulation had important implications for the coeval drawdown of atmospheric pCO2, and the absence of a strong THC system through a glacial-to-interglacial-to-glacial cycle had a major impact on high latitude ice sheet growth. We suggest that the weak NADW export during MIS 24-22 resulted in reduced vertical exchange between Antarctic surface and deep waters, which helped to induce the drop in atmospheric pCO2, and in turn generated significant cooling which facilitated ice sheet expansion. These impacts were amplified by anomalously low Southern Hemisphere summer insolation during MIS 23, which resulted in suppressed ice sheet melting. Increased sea-ice coverage around the Antarctic continent during this time period may have generated increased AABW formation, which would have further drawn down CO2 from the atmosphere. For reference, here’s Hoenisch et al. (2009) and Elderfield et al. (2012). Thanks for all of the great posts. I still need to answer your questions above, but am struggling to absorb all of the informative material you keep posting. Hoenisch et al. (2009) We therefore conclude that CO2 was unlikely to have been the main driver of the MPT. Elderfield et al. (2012). Most hypotheses account for the origin of the MPT as a response to long-term ocean cooling, perhaps because of lowering CO2 (Clark, et al, 2006). Data of CO2, directly from ice cores and in-directly from the d 11 B proxy (47) (fig. S12), are as yet too sparse to determine the respective roles of temperature and of the carbon system. Back in the article I tried to examine 4 sources provided as evidence in Yoshimori et al 2001 for the orbital hypothesis – Theory B.
I could only track down one of the four. This one didn’t seem to be evidence, something of a “we think”, “it’s plausible” and “it might just be internal oscillations”. Not exactly strong..
Two were old books so I can’t get hold of them. The other one was Berger 1988 which Pekka found a link for, and also a helpful reader emailed to me. Recent new evidence seems to have laid to rest the arguments that orbital variations might cause only minor climate fluctuations but not the major climatic changes manifested in the ice ages, the largest and most abrupt climatic changes known during the last 2 Myr. Among the competing theories to explain the coming and going of the Quaternary ice ages and other similar climatic variations of the past, only the astronomical theory (of which the Milankovitch theory is a particular version) has been supported so far by substantial physical evidence. This evidence shows that, both in the frequency and in the time domain, orbital influences are felt by the climate system and implies that the astronomical theory might provide a clock with which to date old Quaternary sediments with a precision several times greater than is now possible. So that’s all sorted then. However, just to be picky.. The paper itself first has a review of the progression of the science ideas around ice ages up to recent times (recent in 1988). Then some basics on the insolation calculations. By the way, Andre Berger is one of the recent pioneers in this field, his 1978 paper being widely cited and widely used. Then a review of the current modeling work (section 7). ..spectral analysis of climatic records of the past 800 kyrs or so has provided evidence that, at least near the frequencies of variation in obliquity and precession, a considerable fraction of the climatic record is driven in some way by insolation changes.. The variance components centered near a 100-kyr cycle, which dominates most climatic records, seems in phase with the eccentricity cycle, although the exceptional strength of this cycle needs a nonlinear amplification by the deep ocean circulation, the carbon dioxide, the glacial ice sheets themselves, and related mechanisms such as the ice albedo feedback, the elastic lithosphere, the viscous mantle, and ocean-ice interactions (remember that the eccentricity variations alter the total sunlight falling on the Earth by only 0.2% at most). In section 7, he comments on the energy balance model of Suarez and Held (1979) who “get a response quantitively similar to the geological record over the past 150 kyrs“. And he comments on other energy balance models. As we saw in Part Seven – GCM I, as we progress through more later, better modeling simulations, things don’t necessarily get better. Even unambiguously producing “perennial snow cover at high latitudes” – the starting point for glacial inception – is still a challenge to GCMs. And terminations are not reproduceable at all in GCMs without prescribing the “internal forcings” of GHGs and ice sheet change. This wasn’t known to Berger in 1988, but Yoshimori et al knew the results of the 1990s GCM problems in 2001.. While forcing is at periods near 19 kyr, 23 kyr and 41 kyr, the model consistently predicts dominant long-period responses, most commonly at 100 kyr and/or 400 kyrs, in addition to significant responses at the forcing periods. The model output thus lends support to the hypothesis that nonlinear response of the Earth system (associated with the growth and decay of the continental ice sheets) to fluctuations of the orbital parameters is responsible for the long-period climate fluctuations recorded in deep-sea cores..
[after review of another model] ..It thus seems that the role of ice sheets in determining the long-period climate response will possibly be clarified only with more realistic parametric modeling of the cryosphere-lithosphere. Strong evidence? Or a tentative hypothesis that is being developed? Further commentary in his paper shows that many climate scientists played around with different factors to try and reproduce the geological record, with mixed success. There’s nothing wrong with trying to reproduce the results but then you have to ask whether “with a melting rate 5 times times the freezing rate” is the correct parameterization, and also whether perhaps the other model that produced “too much 413 kyr power” is the right model – as in, maybe it has more realistic ice sheet and atmospheric physics, but the actual mechanism for the glacial terminations is elsewhere. ..[On the problem of the changing nature of ice ages over the past 2Myr] Imbrie and Imbrie  then conclude that to understand the long climatic records, it may be necessary 1) to develop almost intransitive models [Lorenz 1968], 2) to build stochastic models [Hasselmann 1976], 3) to use models whose parameters vary with time, or 4) to produce in the climatic systems an intrinsic tendency to oscillate at 100 kyrs or a resonance. He then comments further on different researchers who found internal oscillations due to the dynamics of ice sheet interactions with the climate system. This is not surprising – if you can create the major ice age glaciations and terminations with tiny insolation forcings then of course the primary mechanism is the internal dynamics. That should be obvious. And then you ask the awkward question about why significant temperature changes have no impact on this dynamics.. In such a case the variations in atmospheric CO2 could be, in some indirect way, part of the forcing of ice ages, or, better, modulate the response of the climate system to orbital forcing.. this field undeniably merits more investigation. Well, my conclusion from the evidence presented in Berger is different from Berger’s conclusion that was laid out at the start of this comment. There is nothing wrong with his paper except for the conclusion which doesn’t follow. Clearly in his paper the physics linking insolation changes to glacial inception & termination was not well developed – lots of work to do, some promising possibilities but also many problems. Perhaps we could say that in the early days of this field, (early days = following the good quality data that became available in the 1970s) there was lots of optimism that it was just a matter of finding the right mechanism between eccentricity variations and the climate response. He says that only the astronomical theory has been supported by substantial physical evidence and by that I believe he meant the 100 kyr proxy record matching the eccentricity period of 95 kyrs and 413 kyrs. But you need more than a partial frequency match to claim any kind of victory. – the other claims victory but with evidence presented that is not at all a clear victory for this hypothesis. Re your comment above, the first thing I do when looking at a 2001 paper, to say nothing of a 1988 paper, especially when I know the field has been evolving quickly, is look to see how their conclusion have been modified by subsequent work. Yes, papers that old still get cited, but then so does Tyndall sometimes. I know you know this, so what was the point other than to demonstrate the truism that early papers were frequently somewhat wrong? What’s the latest work say? And thanks for your reply, Howard. One reason I didn’t respond immediately is because I need to take the time to look at the Hoenisch and Elderfield papers (which note as you quote them seem to contradict each other somewhat, not just that abstract) in light of more recent work. My expectation is that the role of CO2 will still be a somewhat open question, since if nothing else it’s probably a tough proposition to get sufficiently comprehensive data to model the MPT well enough to do make an attribution statement. On the other hand we shouldn’t lose sight of the fact that the atmospheric CO2 level really does provide the critical ground condition for the glaciations. Of course, take your time. I don’t lose interest because a few days or a week or a month has gone by. In fact, the more time everyone takes to think and review, the better the quality of the discussion. .. I know you know this, so what was the point other than to demonstrate the truism that early papers were frequently somewhat wrong? What’s the latest work say? Good question. Probably I wasn’t so clear about the intention of this part. The casual, or even very determined non-casual, reader of lots of paleoclimate papers might reach the conclusion that “everyone agrees” that the orbital hypothesis for the major ice age transitions is proven. 1. Determine the proportion, out of a decent sample of papers, who say “it’s a mystery”, it’s Theory B or it’s another orbital hypothesis (Theory C family). 2. Identify what evidence is cited as support for the orbital hypothesis for major ice age transitions (evidence up to the time of that paper, not including their new work) and review this. Why so many old papers? Out of the 34 papers reviewed, 29 are 2000 or later, and 14 are 2009 or later. The reason for spending time on Berger 1988 was simply because I asked the question on a few of the papers that cited “evidence” for the “orbital hypothesis”. How good was their evidence? Someone cites Berger 1988, I think we should look at Berger 1988 to see whether this is evidence or not. What does the latest work say? – of course this is of the most interest, and we have been looking at that. In Part Nine we looked at Smith & Gregory (2012). In Part Ten we looked at Jochum et al (2012). In Part Eleven we looked at Shakun et al (2012), Parrenin et al (2013) and WAIS Divide Project Members (2013). In Part Twelve we looked at He et al (2013). And I took up your suggestion for Abe-Ouchi et al (2013) and contacted Maureen Raymo with my question on their modeling work. I withdraw my disingenuous comment. Your comments here have been on point and well researched. It was a knee jerk reaction to some incidents in the past on other sites. I’ll persist in my view that even though those past papers are in varying degrees wrong, the field had then and has now good cause to expect that the final proof will require orbital cycles to explain the timing. It’s simply hard to believe anything else given the clear pre-MPT connection to orbital cycles and the post-MPT periodicity. From a historical standpoint, it’s interesting how the apparent ~100 ky period synchronization was such a red herring. The attempts to find a direct connection evoke Kepler’s long efforts to fit the Ptolemaic model to the new observations of planetary motion. Re Abe-Ouchi et al. (2013), for the moment we can await any response from Raymo, but failing that I suspect James and Jules would be able to answer all the questions (and would have more first-hand knowledge about your computational resource concern). I’m also tempted to email Peter Huybers and just ask him straight up what he thinks. EGU abstracts are available in a week, BTW. ..From a historical standpoint, it’s interesting how the apparent ~100 ky period synchronization was such a red herring. The attempts to find a direct connection evoke Kepler’s long efforts to fit the Ptolemaic model to the new observations of planetary motion.. Right, that’s one of the points that I’m trying to make. Thinking back, if there had not been a 100kyr eccentricity cycle perhaps the field would have developed differently. In fact, it’s very common to find papers introducing the eccentricity cycle then completely ignoring it and working hard to find the insolation determinant (latitude & season) for the termination or inception. Of course, that’s when the problems start because you have 19k, 23k and 41k cycles so it never fits properly. ..I’ll persist in my view that even though those past papers are in varying degrees wrong, the field had then and has now good cause to expect that the final proof will require orbital cycles to explain the timing. It’s simply hard to believe anything else given the clear pre-MPT connection to orbital cycles and the post-MPT periodicity. After reading so many different ideas in a few months the field of explaining inception/terminations started to take on a slightly ludicrous feel. Almost as if anyone could cook up an idea from any insolation curve. With a little more time going by two ideas seem to actually make sense and address the evidence. One is Huybers & Wunsch which puts forward obliquity as a necessary but not sufficient condition for a termination. I commented earlier on that idea. In short, the first approximately 1,500 year period of terminations is almost indistinguishable from the warming phase of a strong Antarctic Isotopic Maximum (Fig. 3b), proceeding at a similar rate, and with the same relationship between different parts of the Earth system. The most parsimonious assumption is that the mechanism of warming is the same. If this is true, we need not ask why southern warming occurs at terminations, because it occurs many times during each glacial. Rather we need to ask why it does not halt, as it does during AIM, apparently in response to a DO event. Although I’m not sure about the latter part of their theory, this one again addresses important evidence not faced by so many “orbital hypotheses”. This is the same concept in the article under the heading: Why Theory B is Unsupportable. I still haven’t done more than a quick skim of it, but Abe-Ouchi et al. (2013) seems to address both of those points. Eighty thousand years of ice-sheet build-up came to a rapid end ~20–10 thousand years before present (ka BP), when ice sheets receded quickly, and global mean surface temperatures rose by about 4 °C. It still remains unresolved whether insolation changes due to variations of earth’s tilt and orbit were sufficient to terminate glacial conditions. Using a coupled three-dimensional climate–ice-sheet model, we simulate the climate and Northern Hemisphere ice-sheet evolution from 78 to 0 ka BP in good agreement with sea level and ice topography reconstructions. Based on this simulation and a series of deglacial sensitivity experiments with individually varying orbital parameters and CO2, we find that enhanced calving led to a slow-down of ice-sheet growth already 5 to 8 ka prior to the Last Glacial Maximum (LGM), as evidenced by the change in curvature of the simulated and reconstructed ice volume time series. Increasing obliquity and precession then led to accelerated ice loss due to ablation and calving, thereby initiating the glacial termination. The deglacial sensitivity experiments further reveal that the ~100 ppmv rise of atmospheric CO2 after ~18 ka BP was a key contributor to the deglaciation. Without it, the present-day ice volume would be comparable to that of the LGM and global mean temperatures would be about 3 °C lower than today. We further demonstrate that neither orbital forcing nor CO2 forcing alone were sufficient to complete the deglaciation. This is the same author team as that of the second AGU fall meeting abstract I linked above, although the subject matter seems to be narrowed to the most recent cycle. Her recent output is impressive, to say the least. I don’t recall seeing anything like that before. After reading so many different ideas in a few months the field of explaining inception/terminations started to take on a slightly ludicrous feel. /snark This is just the nature of progress on a difficult scientific problem. I would point out that with comprehensive direct observations this and many other problems related to paleoclimate would not be hard, or at least not so hard. I’m actually quite pleased at the pace of improvement in understanding, although of course faster would be more gratifying. I have to say there’s some irony in your making that comment just at the time when things seem to be converging to a solution. Reading 20 years of papers all with different explanations made it hard to see any clear data, and made it hard to see the value in any specific explanation. In fact, it’s very common to find papers introducing the eccentricity cycle then completely ignoring it and working hard to find the insolation determinant (latitude & season) for the termination or inception. But in light of Abe-Ouchi’s recent results this seems to have been the correct conceptual approach, right? What was missing was the physical insight of what happens to an ice sheet at its extreme southern extent once a suitable insolation maximum triggers a retreat. eccentricity also makes the subsequent insolation maxima smaller, so the ice sheet continues to experience mostly a positive or near-neutral mass balance. By the fifth precession minimum (24 kyrBP) since the most recent interglacial period, near the eccentricity minimum, the volume of the North American ice sheet reaches nearly 90 m sea-level equivalent (that is, a volume equivalent to a change of 90 m in global sea level). At this stage, the southern margin of the large ice sheet is warm enough that a moderate climatic forcing can cause the ice sheet to retreat. With the subsequent increase in eccentricity, the summer insolation forcing in the next precessional cycle provides enough time and intensity for a rapid disintegration of the ice sheet (note the large excursion of insolation forcing above the upper hysteresis branch; Fig. 2b), which is why a large ice volume, called ‘excess 100-kyr ice’, is observed before each glacial termination. So eccentricity is found to be key to both growth and termination. Obviously it’s too soon to know if Abe-Ouchi and colleagues are correct, but at this point I’m seeing no loose threads or, as noted, pushback from others in the field. That leaves, as far as I can tell, the question of what made the post-MPT ice sheets grow so much larger to begin with. As Howard points out, Elderfield et al. seem to disagree with the proposal that enhanced weathering changed CO2 levels enough to do the job. More reading to do, but overall the bulk of the solution to the mystery seems to be (provisionally) in place. Inspired by your interest in Abe-Ouchi’s paper, I reread it and finally noticed that to understand the approach I needed to read her 2007 paper, which I had downloaded a while ago probably for that reason. The modeling approaches there are not completely clear so I am now following up the references in the 2007 paper to get a better understanding of ice sheet modeling. The essence of the approach is clear but not any of the subtleties. However, I think I understand why there is no mention of the Southern Hemisphere vs Northern Hemisphere timing..
I’ll write more when it is clearer. Yes, that does seem worth a look. The central ideas of the recent papers do seem to have been present in 2007, although the title of the earlier one would seem to imply not wanting to state too strong of a case at that time. The CPD comments and replies may shed some further light on things. The EGU 2014 program is now up. There seems to be just one item re the MPT, basically pointing to CO2 as the likely culprit, and nothing pushing back against Abe-Ouchi and colleagues. I see that Mo Raymo got the Milankovic Medal this year, suitably enough. The second link, once again. Lots of other interesting material there, by the way, noting especially more from Coumou, Petoukhov and Rahmstorf on their atmospheric resonance (increased blocking) hypothesis. Some questions… How long did it take of GIS to grow to it’s current size? Could it take 1.5 MILLION years from the start of AMOC when the Central American Seaway closed? Oceans were warmer back then but still that seems an awful long time. What was the spatial extent of the shorter glacials before the ‘100000’-cycle? Could these be mostly from Antarctic glaciers? Are marine stacks from southern hemisphere totally in sync with the northern ones during these? jyyh: The major continental ice sheets of the last ice age grew up to 3 km thick in less 100,000 years, so there is no reason to assume that the GIS required 1.5 million years to grow. 1 cm/year of net accumulation after snow becomes ice = 1 km/100,000 years, but the layers begin to flow horizontally and thin when the ice above gets heavy enough. The top of the GIS is roughly 2 km above sea level. A good chunk of the GIS (approaching half the volume) melted during the previous interglacial (the Eemian) it was warmer and and sea level was higher. So the GIS probably expanded and shrank many times in the last 1.5 million years. I think you have to work it out. I’ve not tried. I bet lots of people have but also I’ve never looked to see. Thanks, SOD. So in your literature searches, you have seen no discussion?? Perhaps the change of moments of inertia are too small. I have the technical background to investigate and am fluent in matlab and Simulink, and will spend some time on it. Not searched for, and, if it has been mentioned in anything I have looked at, I’ve never noticed. Phil, I know there’s been some work on that with regard to great earthquakes. IIRC the Indian Ocean one a few years back was calculated to have shifted the position of the poles by a few inches. The paper of Sidorenkov on Earth’s rotation instabilities discusses the influence of ice sheets on the rotation. I cannot, however, find any clear and relevant conclusions on these issues from the paper. Here’s a new paper from the Rohling group and co-authors providing what looks like pretty strong support for Abe-Ouchi et al. (2013). The bigger they come, the harder they fall, it seems. Note the interesting sidelight bringing clarity to the Asian monsoon record of the last 500 ky. I love the smell of consilience in the morning. Of far greater relevance to us would be if similar work could be done regarding the speed of the Plio-Pleistocene obliquity-paced fluctuations of the Antarctic ice sheets (IIRC first described by Naish et al. (2009)), even though the forcings then at work were substantially different than at present. Steve: Thanks for staying on top of this and linking to new interesting research. Several key observations can be drawn from our analysis. Second, regarding the onset of Quaternary glacial cycles, we find that a distinct deep-sea cooling step at 2.73 Myr ago substantially pre-dated the first major glaciation in our record, by 0.58Myr (Fig. 3). glacials at ,2.7–2.5 Myr ago (refs 43, 44; Fig. 3a). Our new data challenge this perspective, because the change at 2.73 Myr ago appears to relate to cooling, whereas the first ‘deep’ (sea level below270 m) glacial occurred considerably later, at 2.15 Myr ago. strongly influence widespread oceanic carbon storage and, hence, atmospheric CO2 levels (see, for example, ref. 47). that ice sheets extended to marine margins at 2.64 Myr ago (refs 7, 8). have been relatively ‘mild’ by glacial standards (Figs 3 and 4). temperature) in determining total ice accumulation. SOD: While debating the importance of rising CO2 to warming during deglaciation, I ran into the fact that warming in the Antarctic preceded warming in Greenland by about 6 millennia. Why should irradiation at 65 degN trigger warming in Antarctica millennia before doing so in Greenland? Superficially, the end of the last ice age seems to have begun with increased heat flux (meridional ocean currents?) to Antarctica. Millennia later that resulted in a temporary increased heat flux to Greenland, a sudden halt in that flux – the Younger Dryas, and then a return to warming in Greenland. Whether this happened with other terminations isn’t known because the Greenland record doesn’t go back that far.